Childhood obesity and diabetes in children is exploding across the nation. And it is getting worse. The data projects that by 2030 the number of heart disease cases will quadruple and obesity-related cancer will more than double. The largest majority of these increases will be in the low-income population. These families have a difficult time accessing healthy foods like fruits and vegetables because they just cost more. Low-income families end up eating highly processed foods that are devoid of nutrition that the body needs to remain healthy, simply because they are significantly cheaper. We have bold plans to change this alarming trend in Butte County and we need your help. We may not be able to impact the world, but we can help our neighbors. 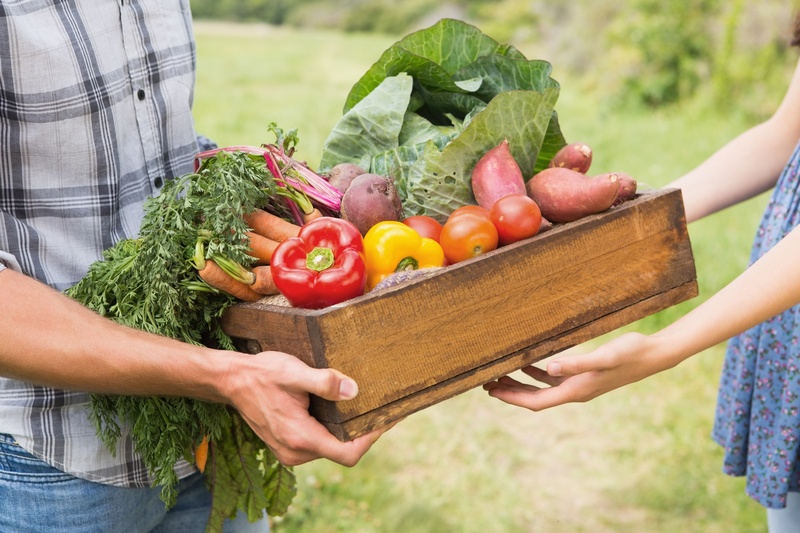 At the Community Action Agency of Butte County’s North State Food Bank, we are committing to increasing our supply and distribution of fruits and vegetables to families over the next year. This means increasing the number and frequency of deliveries. It also means more fuel and driving time. Will you help our kids? We know it’s a bold goal, but big problems deserve bold responses. We couldn't take this kind of stance without the support that you and so many have provided. We ask that you consider joining us in being part of the solution to bringing significantly more nutritious food to our neighbors in Northern California. Together, we can solve hunger and get significantly more healthy food into the hands of our neighbors. So, what can you do to help improve the health of the next generation? We often have enough food, but the real challenge is paying to transport the food across our 12,000 square mile service area. Help us to make dollars go further by donating online! Make helping local families part of your New Year’s resolution for 2018 by helping to give back. Fighting hunger starts at the Community Action Agency’s North State Food Bank. 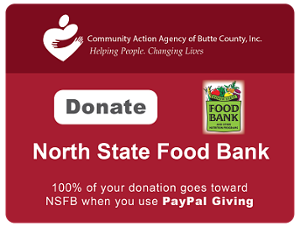 When you Give money to support the North State Food Bank – 90 cents of every dollar goes directly to buying food for families. You might be surprised to learn that with a donation of just $36 you can provide produce for 3 families! We know that not everyone can make large donations and every donation counts. Below are suggested donation levels showing how many families you can help with even just a modest donation amount. Yes I want to help families be “nutritious” every day. All sides for a Thanksgiving Dinner: stuffing, green beans, mashed potatoes, etc. Host a healthy food drive – many people who depend on food pantries have diabetes, high cholesterol or high blood pressure. We need foods low in sugar, fat and salt. Host a protein food drive – shelf stable protein items like peanut butter, canned meats and dried beans. We can use your help -- anything from packing/unpacking food boxes to organizing and advocacy. Whatever your talent is, you can use it to fight hunger at North State Food Bank. Your gratefully received contributions to the North State Food Bank are tax-deductible as allowed by the IRS. Tax ID#94-1640546. The CAA’s North State Food Bank collects and distributes food throughout the service region encompassing Butte, Glenn, Colusa, Plumas, Sierra and Tehama counties. With the help of our extensive network of partners, the North State Food Bank offers multiple programs to help low income families get the food and nutrition they need each month.